To make the counting easy, the letter "Lam" in the verses, 30:21 and 11:70 has been marked in the image and in the text. We also included the transliteration of the same verses. 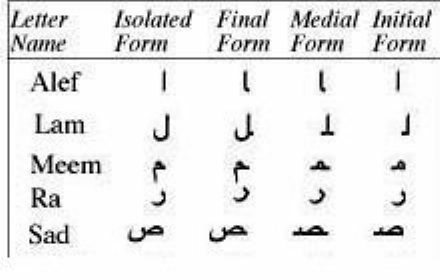 In transliteration, the Arabic words are written in English Alphabets. The Arabic "Lam" is equal to the English letter "L" and therefore the same number of "L" used in the sentence and is equal to the same number of LAMS in the transliteration and can be counted. In this Arabic text, the letter LAM was colored red. In this Arabic text, the letter LAM was colored red. The computer however, because of technical reason in writing this font, in case of D' colored both the Lam and alif red and should be counted as one lam in each. This shows that Rashad's count is wrong in these two verses regarding the lams. This wrong count of the Lams disturb the total of the ALM and the ALR and disturb the whole miracle that has the Alifs in it, in total. These errors have to be corrected or the miracle will exist no more when we know it does. There is no other ways to write these Arabic words with LESS LAMS to make Rashad's count correct. Check with all the Arabic Qurans you can get your hand on and you will see that all agree on the same count of the lams. Since this number of lams in sura 30 ( in red) is wrong, the whole table will collapse. The correct number of lams as a physical fact is written in blue between ( ). If the "Lams" are wrong, the "Alifs" have to be wrong for this initial to be a multiple of 19, and that is exactly what we found out. Since this number of lams in sura 11 ( in red) is wrong, the whole table will collapse. The correct number of lams as a physical fact is written in blue between ( ). If we do not fix it we will be fooling ourselves and fooling the people. We will not be forgiven if we claim to be submitters while denying this obvious error and have no explanation to it and worse than that try to cover it up by all non-sense means. A fact is a fact. If the "Lams" are wrong, the "Alifs" have to be wrong for this initial to be a multiple of 19, and that is exactly what we found out. We have the obligation to correct what we see as obvious errors, even when committed by the messenger of God who was counting these initials to the best in his human capacity. God let him count the initial Alif four times and make errors in the four counts to teach us that he was counting as a human being not as a messenger who was receiving the correct number through revelations as some people claim on their own. God would not reveal a wrong number to His messenger and four times !!!!!. Also, God did not gave His messenger the wrong numbers, but the messenger made his errors like any human being would. God is teaching those who deserve to know a lesson. As God system goes, not everyone deserves these great lessons. How did Rashad count the Alif and Hamzas?